Anyone who has watched Joss’s stuff over the years knows what he’s talking about. These aren’t just characters you relate to, they are ones you identify with. Whole bands of characters in fact. Law firms even. (Although it seldom gets mentioned in the same breath, as far as I’m concerned, Season 5 of Angel is right up there with Buffy Season 2 as one of the all-time greatest seasons of television). 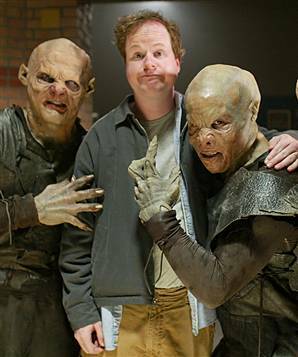 As Joss has remarked elsewhere, the genre trappings and silly dialogue allow him to connect more deeply with his viewers and with himself. But that doesn’t mean they are flaky or contrived–they work extremely well on their own terms. You once tweeted “Everything is a drug. Family, art, causes, new shoes… We’re all just tweaking our chem to avoid the void.” That’s profound and depressing. If you look at the Twitter feed like you look at my work, it’s all me trying to work out my problems–and some puns. And with that one I didn’t even feel like being funny. I remember that one particularly. It was one of those obvious revelations, but I was really feeling it. Everything we do really is just a little marker on the long road to death. And sometimes that’s overwhelmingly depressing to me, and sometimes it makes me feel kinship and forgiveness. We’ve all got the same ending to the story. They way we make that story more elaborate, I got to respect. I think that’s absolutely the case. I think we’re actually becoming stupider and more petty. I think we have one shot–and that’s education, and that’s being defunded along with all the social services. What’s going on in this country, and many countries, is beyond depressing. It’s terrifying. Sometimes I have to remember who I’m talking to. I’ll say something about how terrible things are, and meaningless, and the world is headed toward destruction and war and apocalypse. And at one point my daughter goes, “Hey! I’m 8!” She doesn’t want to hear that stuff. But I can’t believe anybody thinks we’re actually going to make it before we destroy the planet. I honestly think it’s inevitable. I have no hope. That’s surprising, because your work isn’t bleak. Bad things happen, there’s pathos, favorite characters die. But it’s not like the fifth act of Hamlet. No. My stories do have hope because that is one of the things that is part of the solution–if there can be one. We use stories to connect, to care about people, to care about a situation. To turn the mundane heroic, to make people really think about who they are. They’re useful. And they’re also useful to me. Because if I wrote what I really think, I would be so sad all the time. We create to fill a gap–not just to avoid the idea of dying, it’s to fill some particular gap in ourselves. So yeah, I write things where people lay down their lives for each other. And on a personal level, I know many wonderful people who are spending their lives trying to help others, or who are just decent and kind. I have friends who are extraordinary, I love my family. But on a macro level, I don’t see that in the world. So I have a need to create it. Hopefully, that need gets translated into somebody relating to it and feeling hope. Because if we take that away, then I’m definitely right. I want to be wrong, more than anything. I hate to say it, it’s that line from The Lord of the Rings–“I give hope to men; I keep none for myself.” They say it in Elvish, so it sounds supercool. Unlike, say, the defiant mindset of the Dawkins crew, there’s a ruefulness to Whedon’s unbelief that is both refreshing and appropriate, coupled with an understanding of hope that goes beyond the amorphous “hope in hope” that one normally sees on the screen. In fact, Whedon’s work consistently distinguishes between sentimental hope (hope qua hope) and concrete hope, i.e., something with an object. So while the man himself may not be able to embrace any possibility of the divine, he is wise enough–and honest enough–to avoid putting hope in any terms other than that of salvation and saviors. Or maybe it’s just that you can’t be such a preternaturally brilliant storyteller without an intimate grasp of the mechanics of the heart, that free-floating hope rings just as hollow in a narrative as it does in real life. Hope in the Whedonverse is not some disembodied (once-more-with-)feeling. It has specific content–absurd or aggressive content perhaps, but content nonetheless. 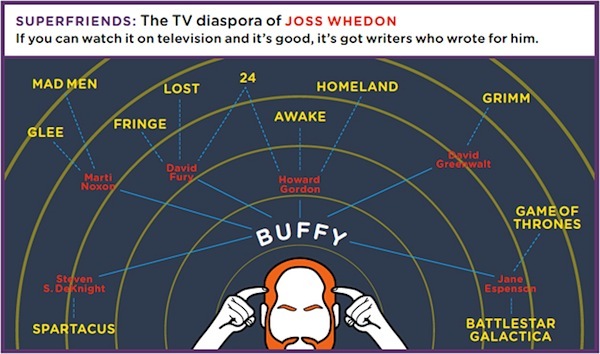 Of course, the ultimate irony here may be that some of us consider Whedon’s success–the fact that someone of his talent and integrity and depth gets the platform he does–a rare basis for hope in human beings, their stories, and their culture. Vampires too. p.s. If you haven’t checked out any of our past posts on Joss, they are some of my personal favorites. p.p.s. Essential works of Whedon? It’s all great, but the very top would have to be: Buffy Season 2&3 (and isolated later episodes), Angel Season 5, most of Firefly, all of Serenity, the first half of Titan AE, the second half of Dollhouse Season 2, Dr. Horrible (and Commentary! The Musical), Cabin in the Woods, and of course… Toy Story.